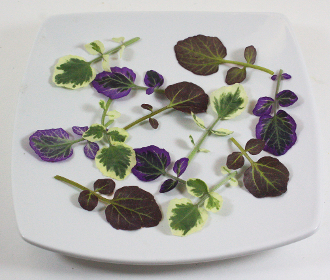 Wonderful, colorful mixture of our varigated Watercress leaves, inlcuding our unique, signature items: Petite Watercress Pink Ice™, Petite Watercress Red, and Petite Watercress White Angel™. Spicy, peppery, sligthly bitter taste. Pair with any savory dish from chicken to fish or seafood!